Canadian National Local train L507, whose crew had run out of time a couple hours ago here in Saukville, had just been boarded by the new crew and was about to resume its journey south as L503. The only reason this photo was possible was that the L507 had earlier run north toward Fredonia and Waldo, and the 10 MPH track makes for an exceptionally long day for the crew. Shots like this in the future will be difficult as CN has been granted authority to abandon this line north of about here. This was a fairly large train, weighing in at 27 cars, including six loaded bulkhead flats of wire from the Charter Manufacturing mill, immediately behind the train. Only ambient lighting was used to make this photograph: an eclipsed moon and the bright lights on the other side of the track. 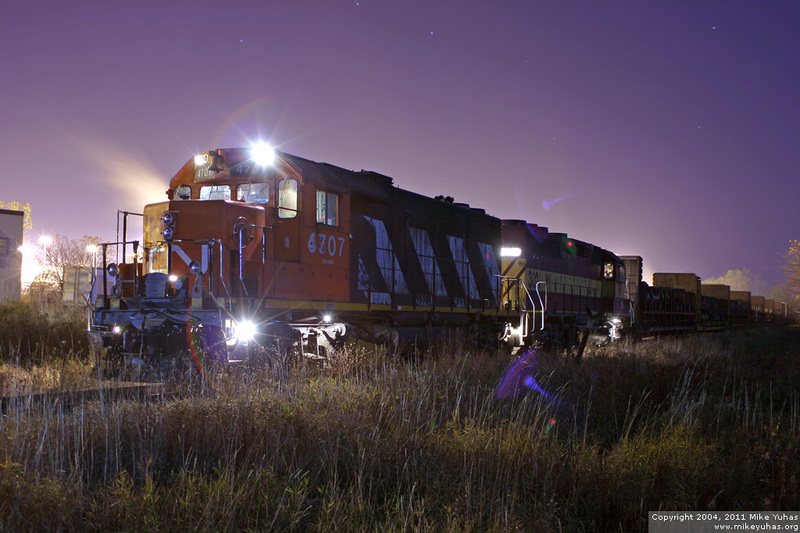 In a moment the headlights would illuminate and the train would whistle off.